The ‘Tubby’ plaque could only really go to one place and that was on the old Hayes family home at 34 Kenwyn Road, Raynes Park. Thanks to the current owners who kindly agreed and who made us welcome on the day, though they wanted to keep it a small event in the end, hence the radio silence. We were delighted that Richard Hayes, son of the great man, could make the unveiling, perfect man for the job. 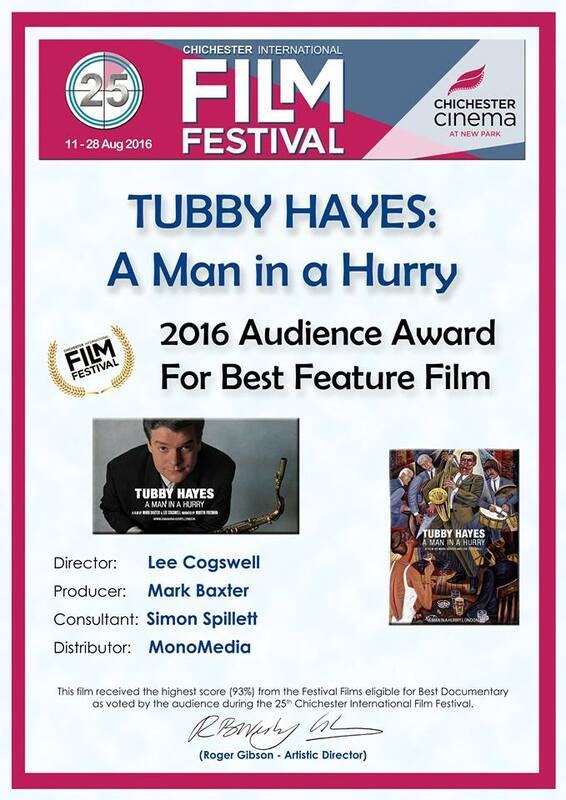 Tubby Hayes – A Man in a Hurry has won the 2016 Audience Award For Best Feature Film, the Chichester International Film Festival. Here’s a short highlights film, from the premiere screening of A Man in a Hurry, at Foyles, London, with the fantastic Simon Spillett quartet.